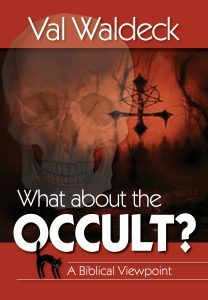 Publications examining religion, religious groups, and religious philosophies in the light of Biblical doctrine and teaching..
What About the Occult? A Biblical Perspective. Dabbling in the Occult is like playing with a rattlesnake. What begins with innocent curiosity can end in a horrible tragedy and the Bible is clear in its warning about the dangers of becoming involved in occult practices. 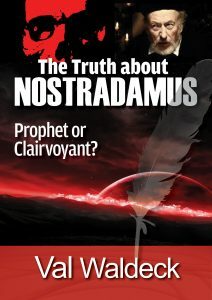 The Truth About Nostradamus: Prophet or Clairvoyant? This book briefly examines the life and works of Nostradamus in the light of Biblical prophecy, taking special heed of the scriptural tests of a true prophet and noting, in particular, his deep and intense involvement with the occult. 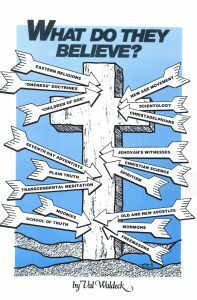 “What Do They Believe?” is a concise, yet comprehensive, look at seventeen major religious movements who are “out of step” with basic Biblical teaching, yet claim to incorporation Christian doctrine in their philosophies. Written for “the man in the street”, this Manual examines each movement briefly under nine doctrinal headings, and includes each one’s “speciality” and history. The Manual also briefly reviews basic Christian doctrine and shows you how to “test” teaching according to Biblical standards. Highly recommended for Bible Studies and teaching sessions, this is a “must have” for anyone who deals with people. “What Do They Believe?” is a resource every Christian should have available. The groups reviewed include Children of God, Christadelphians, Christian Science, Eastern Religions, Freemasonry, Jehovah’s Witnesses, Moonies, Mormons, New Age Movement, Old/New Apostles, “Oneness” doctrines (Jesus Only), Plain Truth, School of Truth, Scientology, Seventh Day Adventists, Spiritism, and Transcendental Meditation. The Children of God: What Do They Believe? Mostly young people, this group hand out little comic book tracts written by their leader, Moses David, and ask for donations for their cause. They teach that Jesus is Lord and claim to be the true believers.” This Cult uses the Name of the Lord to practice the most diabolical deception and the movement is banned in many countries. 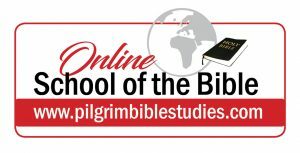 Christadelphians claim to be ardent students of the Bible. Their advertising sometimes appears under the title Berean Bible Students, Enlightening Truths, Back to the Bible, Gospel Proclamation Society or Gospel Publicity League. This cult denies every important fundamental doctrine of the Christian Faith. Christian Science: What Do They Believe? The “Christian Science Church” claims most emphatically that it holds the true Christian position, but a comparison with basic fundamental Biblical doctrine shows that it’s doctrine is the very opposite of what Jesus taught. 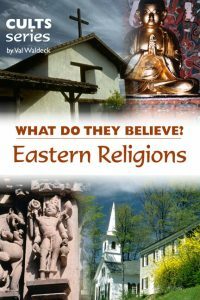 Eastern Religions: What Do They Believe? Eastern religions cover a very diverse field of study. This brief examination of their beliefs presents only a simplified outline of their teaching as compared with basic Christian doctrine. Freemasons: What Do They Believe? Freemasonry is said to have originated at the time of the building of King Solomon’s Temple. Masonry claims to have fellowship with Buddhists, Mohammedans, Hindus, Judaist, etc., in the worship of the Grand Architect of the Universe. They join Jehovah’s Holy Name with those of ancient heathen gods, deny the deity of Christ, the atonement, and the infallibility of the Word of God. At the same time, they claim their movement is not a religion. Jehovah’s Witnesses: What Do They Believe? Moonies: What Do They Believe? The UNIFICATION CHURCH, or “The Moonies” as they are commonly known, is a religious-political Cult. Officially called “The Holy Spirit Association for the Unification of World Christianity“ The Unification Church was founded by the late Rev. SUN MYUNG MOON in Korea in 1954. “The Third Adam (Moon) is needed to succeed where the first and second Adams failed” is a keynote of this religion. The Mormons: What Do They Believe? The “Mormons” prefer to be called “The Church of Jesus Christ of the Latter-Day Saints.” They are divided into two major groups. Each charge the other as being “schismatic” and each claim to be “the true church.” This religion denies every basic doctrine of Biblical Christianity. The New Age Movement: What Do They Believe? The New Age Movement, as it is commonly called, could be likened to a counterfeit “John the Baptist movement, preparing the way for the coming Antichrist and his rule on earth in the end time. It is a global rallying together of thousands of groups and individuals, all working towards a common aim. The Old / New Apostles: What Do They Believe? The movements known as the New Apostolic Church and the Old Apostolic Church have no association with any other orthodox Christian organization. The two groups do not recognize the validity of each other’s ministry or Apostles. The “Oneness” Doctrines: What Do They Believe? Commonly known as the Jesus Only Movement, the “Oneness” doctrines, which claim to be a present-day revelation, are in reality, a revival of old errors propagated and developed during the early centuries of the Christian era. They strongly deny the Trinity. The Plain Truth: What Do They Believe? One of the most amazing stories in the history of the Church of Jesus Christ concerns the Worldwide Church of God. Never before in the history of Christianity has there been such a complete move to orthodox Christianity by an unorthodox fringe church. The School of Truth: What Do They Believe? The “School of Truth” in South Africa denies any connection with other similar organizations. Its teachings are, however, very close to groups such as the Unity School of Truth founded in 1889 and the later New Thought movement. Scientology: What Do They Believe? Seventh Day Adventists: What Do They Believe? Of all the present-day groups, the Seventh Day Adventist movement is the nearest to Biblical Christianity. Its differences are very subtle and not easily recognizable and we share many doctrines fundamental to the Faith. Spiritism: What Do They Believe? Spiritism poses as a universal, common denominator for all religious groups, teaching the continuity of life and the eternal progression of man towards perfection in the spirit realm. This very brief examination compares its teaching to that of Biblical Christianity. Transcendental Meditation: What Do They Believe? Transcendental Meditation (T.M. to its devotees) claims to be a “science” and not a religion. It is deeply rooted in the philosophy of Hinduism and Yoga. This is a very brief description of the basic tenets of this movement.